PARIS — Ten days after the Paris terror attacks, Europe remains on edge. Police in Belgium, anticipating a similar assault, are on highest alert as they press the hunt for the surviving attacker with the help of law enforcement in neighboring nations. In France, the massive investigation continues. Spain and other nations have intensified defenses against a terror offensive against the West by the Islamic State. Weary, tense and somber after the bloodshed, top law enforcement officials from three countries spoke to ProPublica about the threat and and response. Three asked for anonymity because of the dangers they face and because they are not authorized to speak publicly. The counterterror investigator was exhausted. He had spent days hunting for Salah Abdeslam, the remaining fugitive in the Paris attacks. The other suspects are dead. They included Abdeslam’s brother, who blew himself up during the massacre in Paris, and his old friend Abdelhamid Abaaoud, the suspected ringleader from Belgium, who died in a fierce gunfight with French police. But Abdeslam remained on the run, last spotted in Belgium and believed to be wearing an explosives belt like the attackers who killed and died in Paris. A human bomb ready to explode. The fugitive was one of the main reasons Belgian authorities raised the terror alert in Brussels to its maximum level Saturday. The subway system shut down. Soccer games were canceled. Authorities urged people to stay inside and avoid crowded places. Teams of soldiers and police patrolled empty streets looking for Abdeslam and other Belgians suspected of plotting imminent suicide attacks. The investigator had been working in a command post with French police deployed to Belgium to exchange information. He had participated in raids and searches, poring through data from confiscated phones and computers. The week had been a blur. He and his colleagues were still coming to the grips with a grim reality: The extremist underworld of Belgium had helped spawn the most devastating attack on European soil since the Madrid train bombings of 2004. In addition to the physical danger, it was demoralizing to see an unprecedented swarm of foreign media on the streets of Brussels, to hear complaints that Belgian law enforcement hadn’t done more to prevent the attacks. Abaaoud, from the tough suburb of Molenbeek, had been a top investigative target since January, when police killed two Islamic State gunmen in the city of Verviers and foiled a plot launched by the Belgian ringleader. A court convicted Abaaoud in absentia, making him one of Europe’s most wanted men. Yet he slipped back from his base in Syria to lead the Paris rampage. Police believeAbaaoud had been back in Europe for two or three months. He was part of a team of French and Belgian foreign fighters in Syria who trained and deployed operatives on a string of plots targeting their homelands during the past two years. Investigators are trying to figure out why Abaaoud shifted from a remote shot-caller to a frontline fighter. Perhaps senior figures in the Islamic State sacrificed him in order to ensure the success of a terror spectacular, the investigator said. As they hunted for the fugitiveAbdeslam, Belgian police were well aware that more suicide bombers took part in the Paris attacks than had ever struck at once on European soil. The investigator was perplexed about why three suicide bombers hadn’t done more damage at the France-Germany soccer match at the Stade de France the night of Nov. 13. The trio failed to get inside the stadium, and killed only one victim despite the presence of crowds. Another Belgian counterterror official said the mindset of his prey was no mystery. A few days after the Paris attacks, Commandant Mohamed Douhane talked to two colleagues in the forensic division of the French national police. They were experienced, hard-nosed crime scene investigators accustomed to all manner of mayhem and bloodshed. But no amount of experience was enough for the task of working the scene at the Bataclan music hall, a slaughterhouse where three terrorists killed 89 concertgoers. Douhane, the secretary general of the Synergie Officiers police union, has a rare perspective. He’s one of the highest-ranking officers of Muslim descent in the French police, the son of an immigrant bus driver from Algeria. He believes the Paris attacks will cause an unprecedented backlash against extremism among French Muslims. The reaction among Muslims has been stronger than after the attacks in January that killed 17 people at the Charlie Hebdo magazine and a Jewish grocery, Douhane said. One victim in those attacks was a policewoman. The new strike on Paris, ordered this time by Islamic State leaders, “was an attack on the French people, on young people, working neighborhoods, on the art of French living,” he said. French Muslims were shocked and saddened after the Charlie Hebdo attacks, Douhane said. But some had misgivings about the worldwide “I am Charlie” campaign in solidarity with the satirical magazine, which published caricatures of the Prophet Mohamed seen as blasphemous by many Muslims. Feelings were more muted in slums where deprivation and alienation intertwine with criminality and extremism, he said. Anti-Semitism is a sad reality among angry youths in those areas, Douhane said. Terrorists try to worsen divisions in French society, Douhane said. The proximity and power of jihad in Syria has forced French law enforcement to dig in as never before against the nexus of crime and terror. The attacks have highlighted flaws in the French counterterror apparatus. Like other law enforcement officials, Douhane wonders if a recent major overhaul of the domestic intelligence system may have weakened the defenses. Until 2008, the counterterror system worked like this: A powerful agency called the DST conducted both intelligence and investigations of major terrorist activity — a role similar to the FBI’s in this country. A second agency, the general intelligence division of the national police, played a key part with a far-flung grid of officers monitoring extremism and criminality. Known as the RG, the intelligence division detected street-level threats with a mix of aggressive spying and open engagement with mosques and Muslim leaders. At the same time, the RG was the heir of the Napoleonic political police. The division spied on labor unions, students and politicians, and even did its own opinion polls. It also fought turf battles with the DST. Deciding it was time for reform, French spymasters carried out an ambitious fusion of the two agencies. The result today is the General Directorate of Internal Security, known in France as the DGSI. The super-agency has consolidated operations, reduced infighting and eliminated political excesses. But in the process, nationwide intelligence-gathering has suffered at a time of increasing threats, some critics say. The counterterror chief was worried about the Madrid-Barcelona soccer game. And not just because he’s a Real Madrid fan. The match between rival powerhouses is a soccer classic watched by a global audience estimated as high as 400 million. After the suicide bombings outside the Paris stadium, it seems clear that Islamic State sees soccer games as vulnerable, high-profile targets. Spanish authorities deployed more than 2,500 police and security guards for Saturday’s game, an unprecedented show of force at a Spanish sporting event. The match in Madrid transpired without incident. The Paris attacks, which killed 130, are not the worst terror strike in the history of mainland Europe. That sad honor goes to Madrid, where a crew of radicalized Moroccan drug dealers and al Qaida-connected militants planted bombs on commuter trains on March 11, 2004. The death toll was 191. The skillfully timed attack played a role in the upset victory of the Socialist Party in elections three days later. Voters expressed anger at the governing center-right party for its military presence in Iraq and initial mixed signals about whether Basque or Islamic terrorists were responsible. Police pursued the bombers for a nerve-wracking three weeks. The fugitives blew themselves up during a police siege, killing a SWAT team officer. Measured by the number of foreign fighters, the threat in Spain is less intense than in France or Belgium. Spanish police have identified 138 fighters who have gone to Syria compared to about 2,000 jihadis from France. 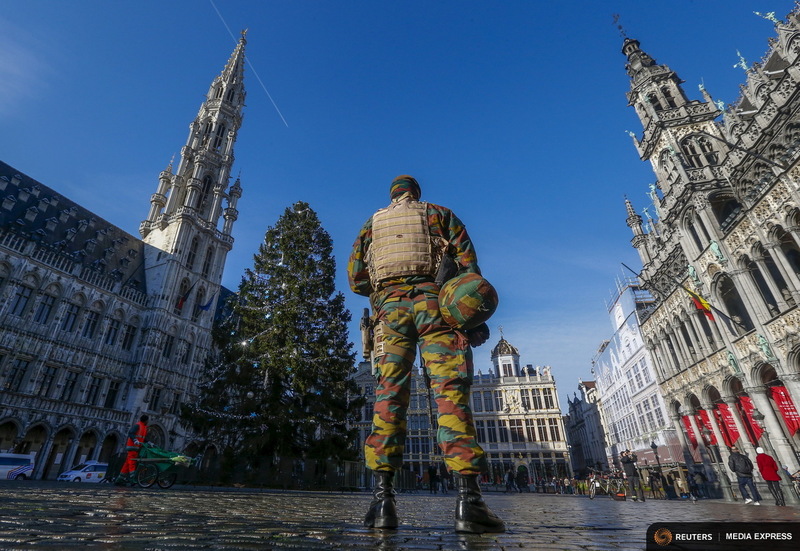 Belgium has counted about 500, the largest proportionate contingent from Europe. Nonetheless, Moroccans are plentiful in the Islamic State. Abaaoud and other attackers in Paris were of Moroccan origin and had links to the country. Spain’s geography as a crossroads into Europe from Morocco makes it vulnerable. Most Spanish foreign fighters come from Ceuta and Melilla, Spain’s territorial enclaves in northern Morocco. They are often grouped with European and Moroccan militants in Syria. Like many others in European law enforcement, the Spanish counterterror chief is aghast at the ease with which terrorists elude Europe’s border controls. At least two of the suicide bombers in Paris are thought to have used Syrian documents and entered via Greece in the chaotic flow of Syrian refugees. An urgent question: How did Abaaoud cross the continent unnoticed to lead the plot? He may simply have used the authentic passport of someone who resembled him, the counterterror chief said. The Paris rampage reflected the savagery of the Islamic State’s reign in Syria and Iraq. Yet, not every foreign fighter returns bent on mass murder. Nonetheless, Spanish police have arrested militants accused of preparing attacks after radicalizing on the Internet without direct contact with the Islamic State. After being arrested at the Warsaw airport upon his return from fighting in Syria, a militant married to a Spanish woman admitted that Islamic State leaders told him to do reconnaissance on potential targets in Europe. The group’s new aggressiveness requires a higher level of vigilance. For more reporting like this, read Sebastian Rotella’s earlier reporting on the rampage in Paris. ProPublica is a Pulitzer Prize-winning investigative newsroom. Sign up for their newsletter.